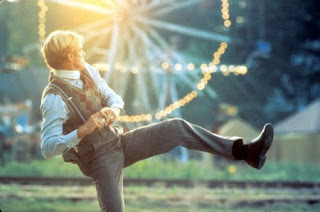 Fourth Row Center: Film Writings by Jason Bailey: New on Blu: "The Natural"
The Natural opens simply, quietly; no music, no fuss, just simple titles and straightforward images of Robert Redford getting on a train. It's a stark contrast to the closing scenes, as triumphant a storybook ending (complete with swelling, Copland-style music and literal fireworks) as one could imagine. It builds to that ending, and earns it. At the time of its release in 1984, critical response to Barry Levinson's baseball fable was mixed, with some appreciating its nostalgic air and clean storytelling, others comparing it unfavorably to the Bernard Malamud novel that inspired it (and its wildly different ending). But it is a film that has aged well and grown in stature; like Field of Dreams five years later, its sports setting has made it an acceptable (and venerable) "male weepie." Redford stars as Roy Hobbs, a baseball player with talent to burn on his way to the majors. While on the train to Chicago, he crosses paths with sportswriter Max Mercy (Robert Duvall), who is travelling with baseball star "The Whammer" (Joe Don Baker). (I at first questioned the credibility of "Mitchell" as a famous athlete, and then my wife reminded me of a gentleman by the name of Babe Ruth. Touché, wife.) During a stop, Hobbs strikes "The Whammer" out, catching the eye of not only Mercy, but a seductive mystery woman (Barbara Hershey). But then the story takes a shock turn, and picks up 16 years later. Hobbs is finally making his major league debut--the league's oldest rookie--for the last-place New York Knights, managed by Pop Fisher (Wilford Brimley). Pop doesn't want to let Roy play, but when he finally does, their winning streak begins. Director Levinson (directing his first film after his astonishingly assured debut, Diner) is playing heavy with the symbolism of Americana--not just baseball, but trains and soda fountains and all other forms of nostalgia. He's dipping into the old movie toolbox as well; the picture's gee-whiz morality and throwback style (it's a positively soft PG rating) are downright Capraesque. But there's plenty of opportunities for subtextual interpretation; some have compared the battles of the New York Knights to Arthurian legend, others to Greek mythology. For me, it is most intriguing (and most risky) in its use of religious iconography. Hobbs is something of a baseball hero as Jesus figure who can summon up miracles and seemingly control the weather, inspired by an angelic woman in white (Glenn Close). What are we to make of all of these loaded images? I think Levinson (and screenwriters Roger Towne and Phil Dusenberry) were creating a deliberately open-ended mythology; whatever portal you choose to read in through is there. Levinson leans a bit too heavily on the montage as a narrative tool (there's quite a few assemblages of game footage and headlines scored to jazzy music), and the 132-minute running time is a little bloated. He's still finding his footing as a filmmaker--a late scene in the judge's office is clumsily blocked--but he's painting on a big, broad canvas here, and doing it admirably. Randy Newman's score would be bombastically ridiculous in just about any other movie, but I wouldn't change a note; it's a perfect fit for this outsized myth-making epic. The music is particularly appropriate during those famous shots of Roy's last at-bat, which have been reproduced, clipped, and parodied--but still haven't lost the ability to dazzle and wow even the most cynical viewer. The phrase "old-fashioned" is too often used as a pejorative, indicating clueless obsolescence. But in moviemaking, an old-fashioned picture can be a good thing; it congers up a specific style and manner of telling a story, and a kind of story that's less easily told in our cynical times. The Natural feels like that; you can easily picture it in black and white, with Gary Cooper in the lead, Deborah Kerr in the Close role, Lionel Barrymore as "The Judge." It's an old-fashioned movie, and that's meant as the highest compliment. "The Natural" makes its Blu-ray debut on Tuesday, April 6th. For full A/V and bonus feature details, read this review on DVD Talk.